I spent a fair amount of time on Twitter and the Internet over the weekend, tweeting, discussing, and writing about the ongoing conflict between Israel and Hamas. And obviously, I’ve been watching, listening, and reading news and other information about the conflict. I have a few random thoughts that I think are worth noting. To those who complain about the “civilian” casualties caused by Israeli attacks against Gaza, let me offer the following: First, how do you know that the casualties are “civilian”? Members of Hamas don’t wear uniforms except for staged parades (in times of peace). So just because Hamas tells you that someone who has been killed is a civilian doesn’t necessarily make it so. I suspect that when we analyze the casualty lists after the hostilities have ended, we will find, much as we did following Operation Cast Lead in 2008-2009 that an enormous percentage of those killed were, in fact, “militants” engaged in operations against Israel. (How do we know? Often just by looking at the websites of Hamas and associated groups or the Facebook or similar posts of those killed where membership in Hamas or Islamic Jihad is often a point of price.) Moreover, when you see statistics that talk about “children” that are killed, please keep in mind that teenagers participating in the rocket attacks against Israel may still be considered “children”. No, I’m not suggesting that 4 and 5 year olds are launching rockets, but I am suggesting that the number of “children” killed is inflated to make Israel’s action look worse. Second, why aren’t those casualty numbers much, much higher? If Israel wanted to be absolutely certain that Hamas had no more rockets, Israeli airstrikes could easily flatten large swaths of Gaza. Israeli missiles could rain down indiscriminately on homes and schools, mosques and hospitals, in the hope that perhaps weapons hidden therein would be destroyed. Israel could, as former Prime Minister Ariel Sharon’s son so inelegantly put it, bomb Gaza back to the Stone Age (and no, I’m not advocating such a policy!). But Israel hasn’t done that. Israel has, instead, endeavored to carefully target strikes against suspected weapons caches, rockets, and Hamas combatants. But even the best and most carefully planned strikes may sometimes go awry, especially when the weapons, rockets, and combatants are located in densely populated urban areas where the true civilian population is used as a broad human shield. One could ask why Hamas has spent their money building weapons caches and smuggling tunnels while Israel has spent money on bomb shelters and anti-missile defense systems. Or, asked differently, how different might the lives of those living in Gaza be today if the government (Hamas) had spent its resources to better the lives of civilians instead of on weapons which were then used in a way that was almost certain to invite Israeli retaliation? For those who think that the differential death toll is particularly meaningful, just ask how many more Israelis might be dead without the air raid sirens, bomb shelters, and Iron Dome missile defense system; how many fewer might be dead in Gaza had Hamas built bomb shelters let alone not fired rockets at Israel in the first place. You should also ask why, if Israel is so “evil”, it has continued to allow food, medicine, and other supplies to cross into Gaza through an Israeli border crossing? Note further that supplies have been held up in the last few days because Islamic Jihad (one of the terrorist groups operating from Gaza with either the cooperation or approval of Hamas) has been intentionally targeting the border crossing through which those supplies pass. Should you wish to say something like “But the blockade!” allow me to remind you that the blockade was not in effect when Israel left Gaza in 2005; it wasn’t instituted until 2007 when Hamas took over control of Gaza. And why was the blockade commenced? Hmm. 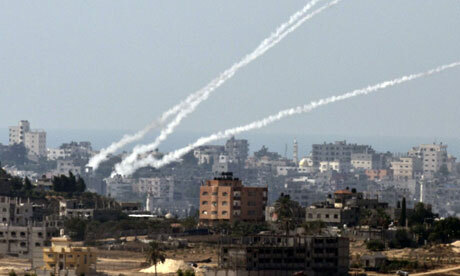 Could it be that Israel was trying to limit the influx of rockets and other weapons into Gaza? It’s not easy to smuggle large rockets from Iran (apparently via Sudan, through Egypt, and then tunnels into Gaza), but it’s much, much easier if they’re simply put in the cargo hold of a ship. Oh, and don’t forget that the United Nations, hardly a friend to Israel, issued a report that the naval blockade of Gaza is legal. While we’re on the subject of legality, let’s not forget that Richard Goldstone, author of the infamous Goldstone Report issued in the wake of the 2008-2009 violence in Gaza, essentially withdrew his own approval of that report. For that matter, why has Israel continued to provide electricity to Gaza or not destroyed the means for those living in Gaza to communicate with the outside world? If this were truly a “siege” as some have claimed, wouldn’t the first act of Israel have been to completely isolate Gaza in as many ways as possible? Yet Hamas’ spokespeople continue to brag about their “successes” on Twitter and on the Internet and are available for television interviews with whomever is willing to listen. Moreoever, Israel has given international journalists virtually free access to Gaza. Of course, let’s not forget that Hamas has tried to hold some of those journalists hostage, located operations facilities in the same buildings used by those journalists, and fired rockets from the streets around those same buildings. In other words, Hamas has used international journalists as human shields, just like the rest of the population of Gaza. When it comes to journalism, it’s also worth noting the penchant of Hamas and its followers to send out bogus news and photos in order to inflame world opinion. Several journalists and newspapers have been “caught” publishing or re-tweeting images claimed to have been from Gaza but which were, in reality, taken in Syria in recent months. Or consider the case of the body of the child that the Egyptian Prime Minster was photographed with, supposedly killed by an Israeli airstrike. Of course, once journalists did even a tiny bit of research, it became readily apparent that the child was killed not by an Israeli airstrike but rather by a Hamas rocket that didn’t make it all the way to Israel and instead landed in Gaza and killed that child. Israel observed a cease fire while the Egyptian Prime Minister visited Gaza; Hamas did not. 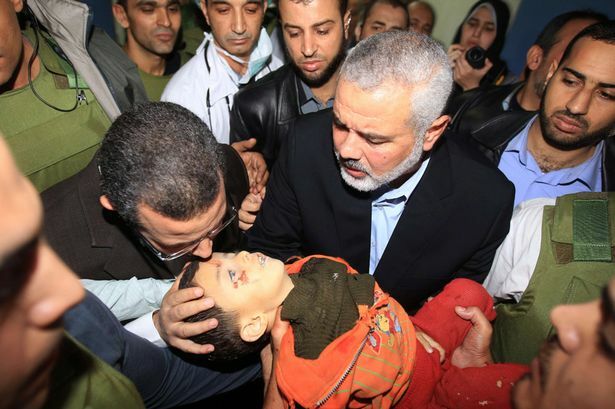 Only Hamas — and not Israel or anyone else — only Hamas is to blame for that child’s death. And, as if the death of that child wasn’t bad enough, Hamas then tried to use his death for propaganda purposes by sharing the photo and blaming Israel. Alqassam Brigades appears to be the official Twitter feed for the militant wing of Hamas. Note that the absolute worst photo that has been circulated of an “atrocity” in Gaza, but which actually happened in Syria, is just so shocking that I’m not going to post it here. Don’t go looking; you’ll regret having done so. Seriously. Though, it does pose the question of why there is so much international condemnation and outcry about the relatively limited number of casualties in Gaza but so little being said about the death toll and scope of atrocities in Syria. According to the Syrian Network for Human Rights (and no, I have no idea how credible that source is…), there have been over 1,000 killed in Syria just since November 8 (and that’s missing several days of data…). But we haven’t seen rallies or visits by the Egyptian Prime Minister or wall-to-wall television coverage of those deaths. Nope. Just the Palestinians in Gaza. Why would Israel, if it didn’t care about the civilian population, send text messages and drop printed flyers warning residents to seek shelter (and telling them where safe areas are) and to avoid members of Hamas? Funny, but I don’t recall Hamas telling people to leave a particular bus or pizza parlor before a suicide bomber detonated his bomb. And it’s telling that Hamas ascribes the act of trying to reduce civilian casualties to “Israeli terror” as it urges civilians to stay in their homes where they can continue to act as unwitting shields for the weapons hidden in, about, and under those homes. Please stop and think about every other military conflict in the history of the world. I know, that’s not a small number. But can you identify any other military conflict in which one side worked as hard as Israel has done to minimize civilian casualties? That’s a serious question. Or, perhaps just limit your thought process to some recent conflicts: Libya, Yemen, and Syria. How about any of the innumerable wars in sub-Saharan Africa? The civil war in Sri Lanka? Iraq? Afghanistan? That’s what the Hamas version of justice looks like. Can you imagine what Israel would look like if Hamas were to achieve its goals? Yes, violence is bad. Yes, peace would be much better. I do believe in a two state solution. I think that the Palestinians should have their own state where they can live in peace beside Israel. But sometimes the only way to achieve a peace is through violence. And certainly, when one said is committed to a strategy of ongoing violence, especially aimed indiscriminately against a civilian population, then the only way to achieve the peace may be to demonstrate that the indiscriminate violence will not lead to a “victory”.